For all of you wanna-be runners out there (And I say that with the utmost respect, as I am one of you). A word of caution: If it’s been awhile since you laced up, might I recommend not lacing up on 60 degree inclines. I recently had to opportunity to go on a “Freedom Fest” in San Francisco. I cashed in my miles and booked a solo trip for some much-needed rest and recuperation. I was all sorts of jacked up to see the city, explore, eat, wander aimlessly, and kick-start my running career. (Did I mention in a moment of panic and sheer aimlessness I signed up for a half marathon in less than 6 months?!!!) I flew in late in the afternoon, found my way around the city on the BART, had a lovely sushi meal, explored a little, and promptly fell asleep early. I awoke the next morning before 6AM, lets face it, old habits die-hard even on vacation. I sprang out of bed, dusted off my running pants, and laced up; fresh-faced, bright-eyed, and bushy-tailed, ready to seize the run! I went down to the hotel lobby where they were rocking (loudly) some GaGa song, and felt renewed energy I haven’t felt in a long time. I was pretty darn motivated. I walked out the front door and stopped. People were passing by the hotel, clutching their collars around their necks, holding fiercely to their umbrellas, and gawking at me with my running shoes on and headphones in, as if to say “She can’t be serious.” I stood there a moment, both taking them in and allowing them to take me in. By God it was raining in San Fran, and these people thought I was bananas! I flipped to the next song on my playlist and took off running in the rain. I don’t know if you’ve run in the rain or snow before, but where I’m from, if it’s not a freezing rain, it’s a blast to run in! I quickly passed the “huddle walkers” and started off on my laced up adventure. I made it 1.5 miles. Up hill. Both ways. I thought my legs were going to just break off and walk away, possibly middle-toe me on their exit. My lungs were burning for oxygen, my head was dizzy. It was an impossible run. And it was my first since August. But I was proud of myself. I was alone in a new city. I was out on a run in the rain. I was rocking 15 minute miles up hill the whole way. I deserved a Starbucks for this! I stopped in at the nearest SB, ordered my traditional, and walked confidently out the front door. It was here that I realized, holy biscuits, I’m totally lost in this city. Up is down and right is left in SF. So much of the city is surrounded by water, so if you can see over the hill to know there’s water there, depending on where exactly you might be in the city, that could be west….that could be south. Or was it North? Let me just point out this obvious flaw for you: Do not have a Starbucks after a run, then decide to run again once it is gone. This was a fatal flaw, lets just say by the time I ran through the front door of the hotel I must have been a sight to see: Dripping wet, red-faced, bent in half, near dead. The broken elevator could not get there fast enough, and there was no way I was running another 6 flights of stairs. Needless to say, I made it to my room, and spent the next few hours recovering. Always be motivated and excited by the newness of your situation and be certain that your coffee intake is situationally appropriate. Let’s talk about the bigger picture. There are a lot of people in my tiny little circle. Ok that’s already a contradiction in and of itself. My tiny little circle, which is tiny, and I like it tiny, and I keep it tiny on purpose, for a reason. But, of this little circle, I’m starting to sense that the majority of us are just hovering, barely hanging on to this side of “Not crazy”. Some of us like to call it a ledge. We often will text each other and say, “Ledge!!!! !” Which means, “You need to call me right now, and tell me if I’m crazy, or tell me if I’m completely in my rational, sane mind”. We have stocked our community padded cell with various accoutrement. Some of us have vodka. Some of us have whiskey, that’s the latest one. Some of us have books and wine. Some of us have music to just, blissfully coast through the rest of eternity. Usually we are able to pull each other back from that ledge. Back from a full sprint into the free fall of insanity off our ledge. We are able to talk each other down. Be positive, find the light. Turn a situation around so that it is not as bad as we think it is. And lately, I’m starting to see that, we’re having a hard time looking at the bigger picture. Because the bigger picture is terrifying. I think all of us are hiding in the day-to-day, minute to minute, hour to hour stuff that we have to do to manage the current crisis. Because if we pulled back and looked at it in a bigger scope, I think it would be overwhelming. I think it would overwhelm each one of us on a different level because we’ve all got a different weird big picture to look at. None of ours are the same, but it would overwhelm us. I think it would cripple me. If I looked at it all, if I looked at everything. From work, two years from now. To school. To Bacon and all of his growth and growth that still needs to happen. To my own work that I need to do on myself. To Peanut and the possibility of things that we do now corrupting the innocence she has later. Things that she may hold onto subconsciously that we don’t even know she’s holding onto. Things we don’t even know we’ve said. Things that her mom has said. We have no idea how to combat it. And the idea of stepping back, and looking at all of it and thinking, maybe if I look at it in the bigger picture I can constructively form a plan and I can make a spreadsheet, and I can figure this out. We can do this! I think it would cripple me if I stepped back, and really looked at it. So where does that fear come from? That’s the question. Does it come from the way we were raised? Were we raised to live minute by minute? Do we have parents or parental figures in our lives that just keep going? Just keep going keep going keep going. They never necessarily, I’m not saying they don’t make a plan, but they’re constantly reacting and doing damage control. And what is damage control when you really think about it? Damage control is spinning whatever just happened, or blew up in your face, into a positive direction. Using it positively. Finding a way to work within the boundaries of that bomb that just went off in your life. Finding a way to adapt. Isn’t that truly what damage control is? Because you can’t take back the past, nobody can take it back. But isn’t that essentially at the root core of it, what damage control is about: finding a way to adapt to the things you can’t control. And really, at the end of the day, control is an allusion we invented to bring ourselves peace. We don’t really have control over anything other than ourselves (And I’m not too certain about the consistency). So maybe when there are fires surrounding us, and too many crisis to manage, maybe we look at all the “damage control” differently. Maybe instead of hitting the panic button, and throwing ourselves willingly off the ledge, maybe we starting looking at all these fires as God or mother Nature or the universe’s challenge: You were built to adapt. You were made to not only survive, but thrive. And today is just another day to prove it. Do you ever find yourself starting your thoughts or sentences with “I wish so and so would…..”? Is it usually when you are frustrated with that persons behavior or communication. I’ve found myself saying this a lot lately, more specifically, “I wish she would self-assess and focus on her development” I find often I am helping other people to take those internal views when dealing with a problem, but this one person I can’t help. I wish I could change her. I wish I could give her the help she needs. I wish she was able to look inside for the problem she needs to solve. I have a hard time understanding people that believe everyone else is at fault for the way things are in their lives. I struggle to contain my frustration and anger that they don’t realize if they just worked on one little thing about themselves, things might get better. A friend of mine once enlightened me that most people aren’t like me. To this I replied, “I don’t want people to be like me, I want to be more like people”. Now wouldn’t that solve all my worlds problems?! What she meant by her statement was that I’m hyper sensitive and aggressively yet positively critical of myself (For the most part, I’m no Mary Poppins of positivity all the time). I listen when you speak to me. I accept your differing view (to an extent, let’s be honest you aren’t always a genius). I want to be a better person. I know I’m not the best version of myself right now. I accept that some days, I really don’t care if I’m the best version of myself. Sometimes being the best version, is down right exhausting. And trying to be the best version, but not succeeding, is just depressing if you go on too long. And I didn’t see it coming. I failed in my career for the first time in my life. And you should know, when I do something, I do it full tilt. So this was not a minor fail, this was epic, turn in the keys to the castle, you’re going down for this one, failure. All those hours, all that time in the car, all the sadness and stress and time away from my family, the precious little time with my family: for nothing. To fail. I spent 3 days straight in bed after that. I could hear Peanut asking if I was ok, was I going to play today, what was I doing, can she come in by me. I struggled to get out of bed for 20 minutes just to have dinner with my family, and I only made it 2 minutes before I had to walk away. I was rapidly falling apart at the seams. I had nothing holding it all together; my drive was gone. Now why am I telling you this depressing sob story and being dramatic? Because I learned an important lesson, one that I will need to remind myself of frequently in the next few years. You must always take care of you. You are useless to anyone else, if you don’t take care of you. You may be super woman, and carry on that way for months, even years. But super woman is not sustainable. You are a real woman, and real women need a time out. We need to be kind and loving to ourselves not just everyone around us, otherwise its all going to come undone in the end. I could not remember the last time I had done anything, just. for. me. I’d done enough fun things that involved other people, but was it ever just for me? Such a strange position to be in, thinking you’ve been killing it. You are successful. You’ve got it all together. Everyone is happy. Everyone is having their needs met by you. And then turning the view inward and realizing, you do not have it together. You are not killing it. You are killing you. Every once in awhile, when you are rocking the schedule, making the dinners, packing the lunches, folding the laundry, picking up all the dog poo that’s accumulated in your yard; stop and ask yourself in all this, what is just for me? And when you come up short, don’t beat yourself up, just put down the pooper scooper and go for a run. It’s time to take back your happiness, even if it’s only for a couple miles. Lately, Peanut is being told that what she feels is incorrect, and as I wrote this I realized we are equally at fault. The fear, is that as she continues to grow and relate to herself, she won’t trust her feelings and emotions because she’s being told they are wrong. I struggled with trusting my emotions for many years. I was in my twenties when I finally broke and accepted that feelings are never wrong. What can be wrong, is your actions you take based on your feelings. I do not want that hardship for her, so many regrets, so much heartache because you couldn’t trust yourself. If you don’t trust yourself, who will you ever trust? And if you can’t trust others, what life do you have? As humans our sole purpose is to connect with others. I am still struggling to fulfill my purpose, struggling to learn to trust in others, struggling daily to believe in my own instincts. So how do you combat damage to your emotional health? Specifically, when the assailant is unaware, unmoved, or unconcerned with long-term effects? We’ve started to teach her what feelings are and how to identify them. We’ve also taken a hard look at how we respond to melt downs and tantrums and crying fits for “no reason”. Both of us are guilty of brushing it off, laughing, or worse telling her to buck up. We don’t stop to allow her to be angry. We aren’t patient with her tears that we see as futile. Children feel heavily, but often it comes out over a spilled juice or a paw print on a new sweater. And to us adults, having 30+ years on this planet suffering, learning, growing; we see these “epic moments” as silly and foolish to cry over. So we try to teach that, help the child learn that some things in this world are worth crying over, but spilled milk is not one of them. What is wrong with us? 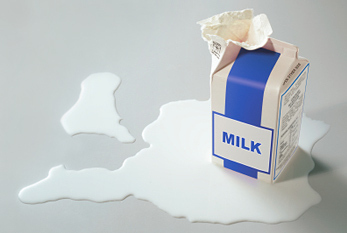 To a child, spilled milk is their entire world. It’s everything in their view at that moment in time, and they’ve just ruined it. Spilled milk is a loss of control to a little girl who has no control over what’s going on with her. She has no say. No input in whose house she sleeps at that night. No choice that her parents don’t live together. So to her, she has her milk. She wants her milk. She’s going to drink her milk as slow or fast as she desires. And then the universe comes swooping in, and takes that choice away from her. How do you, the great all knowing adult, react when the universe spills your milk? Let’s stop telling children their emotions are wrong for the situation. Let’s welcome and embrace those emotions, and start teaching them healthy ways to respond and accept their feelings. Being sensitive should be seen as a value to strive for in this world, and we could all use a little more patience. I’m a fairly glass is half-full type of person. I’ve been knocked down more times than I can count, dealt with an amazing array crap, and still have usually been able to bounce back, keep it together, not completely lose it. He’s peed on every square inch of the floor, the rugs, my leg, Bacon’s leg, Peanut’s leg, Peanut’s mom’s leg, pretty much everywhere EXCEPT a fire hydrant. Now this isn’t just a rant about my big dumb dog, who by the way is SUPPOSED to be the smartest of dogs. No, this is a dark time for me, that I am only now coming out of. There came a point in our new life with this beast where I gave up. I couldn’t take the stress of work, Peanut, The X, the drama, and now this. damn. dog. I hated him. Do you have any idea how awful and crappy that makes a person feel? To hate an animal. Thats pretty dark. It wasn’t his fault, and I avoided him at all costs. If I’m being honest it was during this time that I avoided my entire family at all costs. I stayed late at work (Sometimes actually by choice) because I couldn’t face them, I was worried my head would explode and irreparable damage would come vomiting out of my mouth. Yep. This is the lowest I’ve ever gone. I wasn’t just violently face-planting off a building into the bottom of an emotional barrel; I carefully and lovingly created the barrel, measured the distance, and attempted a swan dive into it. So, how did I peel my face from the scratchy, weather-worn, hardened planks at the bottom of my emotional pit? I didn’t. I’m not out yet. But, I did go back to see my therapist. I did reach out and call my best friend. I did go see my sister. I did let my mom in on how low I really was. And in the end, ultimately, I took a real time out from everyone for four hours (ON family movie night) and I started to paint again. I have a pretty dark side. Welcome to Step Mommy Run. I’ve never blogged before, but I find that I talk a lot, I make people laugh, and I am creative and want to help others. One thing I’ve discovered about being a Stepmom is that no matter what people tell you, no one can prepare you for some of the highs and some of the lows. My family always wondered about me when I was growing up, “will she be a nunn” “will she have children” “My God that child has control issues”. So no one ever saw “Stepmom” coming, and most of them are still reeling from what that means. Did I mention I’m a runner? Well, I used to be. No, no, I was trying to be. Then life, parenting, commitment to relationship development, new job, family, the list goes on….suddenly jumped in and stole my running shoes. Literally, my running shoes disappeared for at least a couple months when we all moved in together! Join me in some of these highs and lows. I promise to be honest. I guarantee I’ll be “ugly”. I’ll try share my ways of coping, and lets be honest, sometimes “checking out”. Most of all maybe we won’t feel so alone in this journey. I’ve noticed there are few “stepmommy groups/meetups” in my area. I spend time combing the internet for blogs or “help me” answers to some of the drama I face. Many of my friends and family do not personally know a step parent, and therefore have no idea how to respond or act accordingly….did I mention I’m crazy sensitive and have been all my life? Words have impact on a high level for me. Also, I’m very random, so that should provide some entertainment.